The cathedral had been undergoing a badly needed renovation after decades of deterioration due to pollution, acid rain and the ravages of time. Flames and smoke rise from a fire at Notre Dame Cathedral in Paris on Monday. 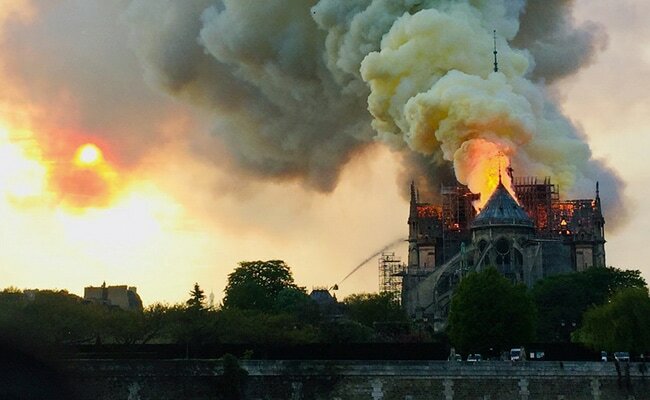 Cathedral spokesman said the building had sustained "colossal damage"
The fire, which came during Christianity's holiest week and was apparently accidental, left a smoldering stone shell where there had once been a peerless work of architecture, engineering and craftsmanship. "Nothing will remain from the frame," he said. But late Monday, after hundreds of firefighters spent hours dousing the building with jets of water, Paris fire commander Jean-Claude Gallet said that the iconic twin bell towers that stand astride the building's grand entry had been saved. "I tell you solemnly tonight: We will rebuild this cathedral," he vowed. "Notre Dame of Paris is our history," Macron continued, emphasizing the structure's unique place in the national imagination. "The epicenter of our lives. It's the many books, the paintings, those that belong to all French men and French women, even those who've never come." The cathedral had been undergoing a badly needed renovation after decades of deterioration due to pollution, acid rain and the ravages of time. Officials said they were considering the blaze an accident relating to the construction. The Paris prosecutor's office opened an investigation. Yellow clouds of smoke billowed into an otherwise perfect blue sky and orange flames assaulted the belfry. At twilight, a gaping hole could be seen where the enormous vaulted roof once had been. Flames continued to lick the night sky as an impromptu chorus in the streets below somberly sang "Ave Maria," some members falling to their knees. Initial reports in the French press suggested that many of those pieces had already been removed last week during the renovations, and Finot said that the cathedral's collection of sacred items, kept in the sacristy, were likely unharmed. "Normally there is no risk of things being burned," he said. Officials later confirmed that two of the cathedral's most precious relics survived the flames: a tunic worn by Saint Louis, a 13th-century French king, and the crown of thorns that Jesus Christ is said to have worn before his crucifixion. The building, the cornerstone of which was laid in 1163, is the most visited monument in Paris, with more than 12 million people coming each year - nearly double the people who visit the Eiffel Tower. Its intricate stone gargoyles, spires, stained glass and flying buttresses have made it one of the great masterpieces of architecture. The church is both a literal and figurative center of the city: It anchors the Ile de la Cite, the island in the Seine where the first settlements emerged that eventually became the city of Paris. The common distinctions of "Left Bank" and "Right Bank" are in reference to this island. Until Monday night, Notre Dame had managed to withstand both the elements and the vicissitudes of history that left their mark elsewhere in the French capital: the French Revolution, the Paris Commune, two world wars and Adolf Hitler's demolition plans in 1944. Pope Francis issued a statement late on Monday expressing the Vatican's "shock and sadness" at "the news of the terrible fire that devastated the Cathedral of Notre Dame, a symbol of Christianity in France and in the world." "We express closeness to the French Catholics and the people of Paris and we assure our prayers for the firemen and those who are doing everything possible to face this dramatic situation," the statement read. "I do not have a strong enough word to express the pain that I feel," tweeted Paris Mayor Anne Hidalgo. Later, after visiting the cathedral's interior late Monday, the mayor told reporters that the damage had not been as bad as she initially feared. "I came because we live in Paris and because, well, last week we were all there, having a drink on the steps of the cathedral, enjoying the beautiful flowers in the garden," said Fatima Marie, a 35-year-old Parisian. "We thought it would be better to be here among friends." "For me, this has been an inspiration for so many other churches in Europe," Hammami said. "It's been here for all those ages." "This is a historic moment for all of us, in the worst possible sense of the term," she added. "It's not just the medieval features," tweeted Kate Wiles, a scholar at King's College London. "It's a palimpsest of work and rework, and building and rebuilding, and we've lost all those layers. It's not just the 'original' masterpiece we're losing, but the culmination of some 900 years of history, which can't just be rebuilt." 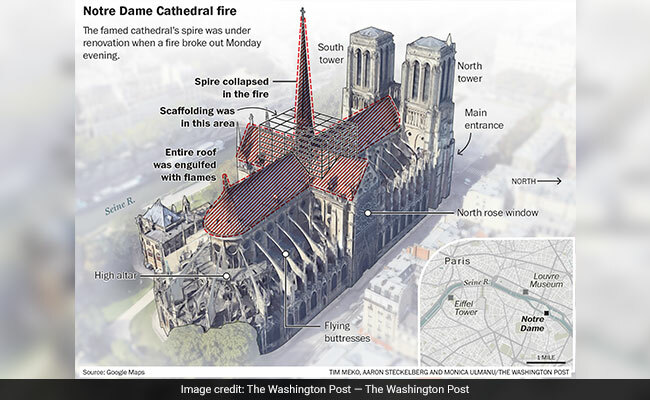 The spire that collapsed on Monday is not an original component of the cathedral. It was added in the 19th century, when tastes veered toward a Gothic revival, by the architect Eugene Viollet-le-Duc. The gargoyles - immortalized in Victor Hugo's classic novel "The Hunchback of Notre Dame" - were likewise added in the 19th century. Throughout French cultural history, Notre Dame has served as a powerful symbol of Paris and of France's cultural heritage. The writer Anatole France once described it as "heavy as a hippopotamus" but "light as a butterfly." The painter Marc Chagall depicted it in his canvasses, distorted in dreamlike haze. President Donald Trump tweeted his advice to Paris on Monday: "So horrible to watch the massive fire at Notre Dame Cathedral in Paris. Perhaps flying water tankers could be used to put it out. Must act quickly!" French fire services tweeted in apparent reply that "dropping water by airplane on this type of building could result in the collapse of the entire structure." 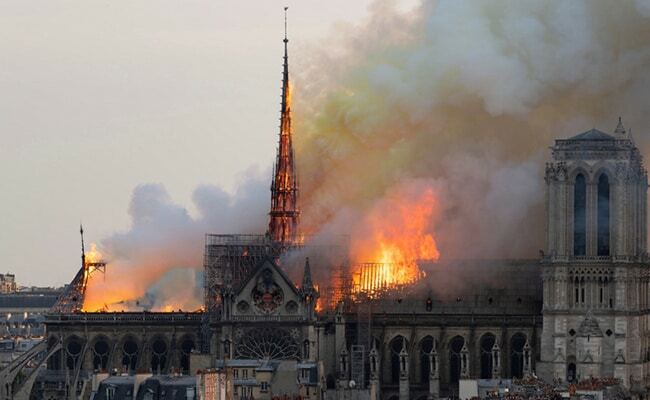 Francois-Henri Pinault, the chairman and CEO of international luxury group Kering, which owns brands like Gucci, Yves Saint Laurent, Balenciaga, and Alexander McQueen, has pledged 100 million euros towards rebuilding Notre-Dame, according to a statement. Paris's Church of St. Sulpice was set on fire after midday Mass last month. No one was injured. Police are investigating, but firefighters attributed the blaze to arson. 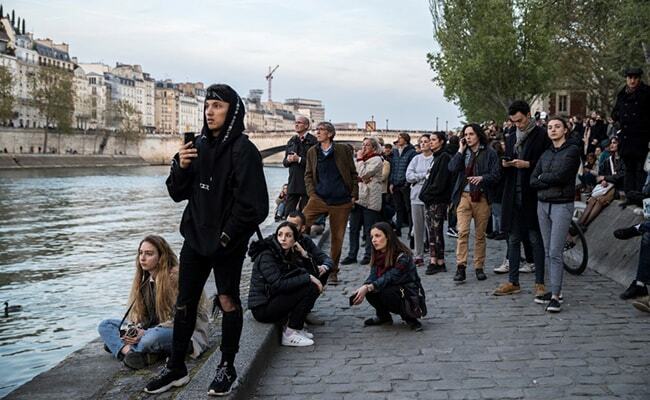 The possibility that foul play had been the cause of the Notre Dame fire was on the minds of some of those who watched Monday evening as the cathedral burned. The fall of the central spire - toppling amid an inferno - added resonance to the comparison to another tragic blue-sky day nearly 18 years ago. "I was in New York on 9/11 and this reminds me of that," said Donna Calhoun, 57, a professor of mathematics from Boise who is on sabbatical at the Sorbonne. "Notre Dame of Paris is Notre Dame of all of Europe," tweeted European Council President Donald Tusk. "We are all with Paris today."